Few times in U.S. history have been as turbulent and transformative as the Civil War and the twelve years that followed. Between 1865 and 1877, one president was murdered and another impeached. The Constitution underwent major revision with the addition of three amendments. 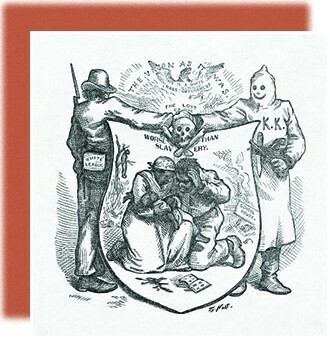 The effort to impose Union control and create equality in the defeated South ignited a fierce backlash as various terrorist and vigilante organizations, most notably the Ku Klux Klan, battled to maintain a pre–Civil War society in which whites held complete power. These groups unleashed a wave of violence, including lynching and arson, aimed at freed blacks and their white supporters. Historians refer to this era as Reconstruction, when an effort to remake the South faltered and ultimately failed. The above political cartoon expresses the anguish many Americans felt in the decade after the Civil War. The South, which had experienced catastrophic losses during the conflict, was reduced to political dependence and economic destitution. This humiliating condition led many southern whites to vigorously contest Union efforts to transform the South’s racial, economic, and social landscape. Supporters of equality grew increasingly dismayed at Reconstruction’s failure to undo the old system, which further compounded the staggering regional and racial inequalities in the United States.